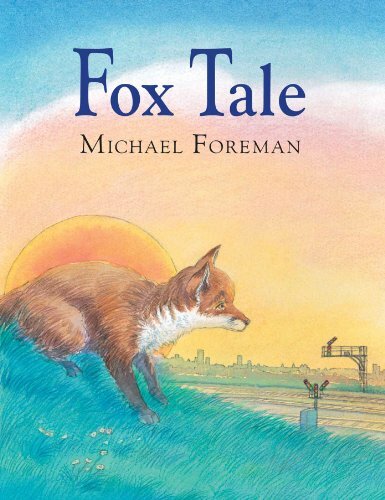 A fox cub tells the story of how his family lives on an urban railway bank, scavenging nightly for food as well as being fed by a kind old gent in the station car-park. When this benefactor is set upon and injured by a gang of hooded ‘man-cubs’, the foxes put the gang to flight while the gent is ambulanced away. A few nights later, one of the hoodies makes a wary car-park comeback, this time with fox-fodder. Equally warily, the foxes feed. Eventually the old gent limps back; by then the narrator has befriended the hoodie and they feed together, and watch the trains go by. A simple ‘improving’ tale filled with Foreman’s accustomed luminous landscapes and indistinctly featured people. It is the excellence of the fox portraits that raises this picture book slightly above the unexceptional.